Spring is almost here in Washington D.C. Top priority food to prepare is salad and salad and salad... No matter where you are or where you go, to the lake to the river or picnic, always salads fits. Noodle salad, tabouli, fettoosh, and greek salad one most be always ready to enjoy the food and the place as well! Salads are easy to make, however the secret always is selecting the correct combination of greens with the right dressing and then you're good to go. Here I used cooked beets and avocado with sweet pepper, the cheese was Halloomi, but other kind of cheese will work, as I did try it with Feta and tasted great! The aged balsamic vinegar is a good choice always with similar kind of dressing, I mixed balsamic with olive oil, oregano and roasted sesame seeds, and finally black pepper. We didn't make this dish often in the past, but my son loved it when he tried it first at school, I couldn't tell how did it taste there! 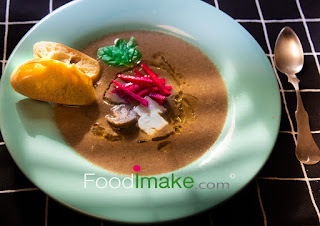 Cz there are tons of recipes for this dish. So I made mine, but I twisted the name for my son, so he may try it without comparing the taste to his first experience. As normally what you try first will become the standard and the best even if it wasn't the original!! 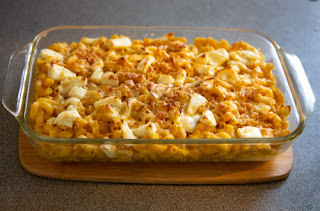 So I called mine "Halloumi Macaroni Tray" and my son loved it!! Although later on he discovered the trick, but he still like mine even butter then the school's copy. I intended to add to the famous traditional Mac Cheese dish extra topping of Halloumi cheese, this cheese has a high melting point, with unique nutty flavor, and It's made of sheep and goat milk. This touch really made the difference for sure! The only thing not great, that the dish in the video here came out less moist then I wanted to be, therefore I tweaked the recipe for 3 cups of milk instead of 2 1/2 in the video, and that will do it perfectly. I hope you will give it a try. Oil the water with dash of salt and cook the macaroni, after it's cooked place in strainer under cold water. In a medium size pot, heat 3 tblspn of butter on medium heat, then add the flour, paprika and turmeric, stir for 2 - 3 min and then add the milk, sometimes at this step four with this amount of butter will make some lumps, not to worry whisking will resolve those completely, and you will have a less fat at the dish! Add the milk and whisk the mixture till gets smooth and little thick, let it boil for one minute and then turn off the heat, and add the macaroni mix it well, then add half of the Cheddar and Gruyere cheese. 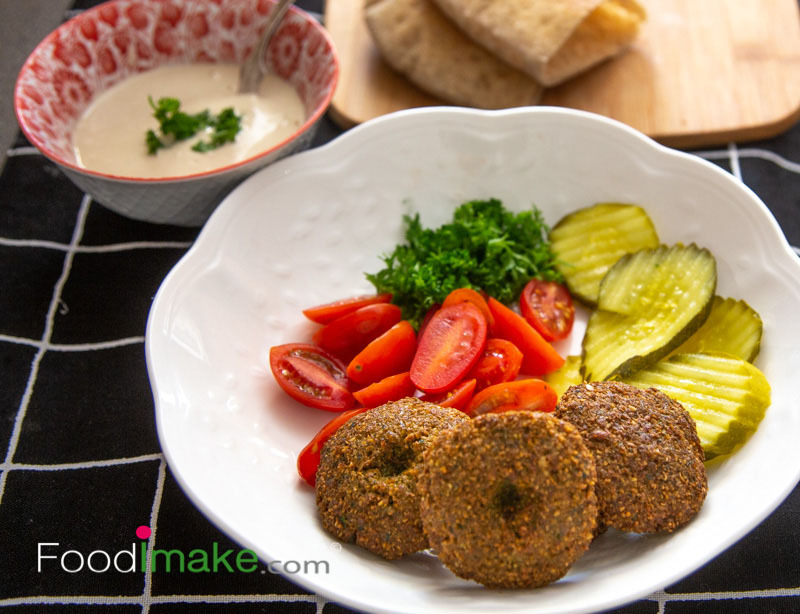 Falafel Veggie Berger is Food of Heaven! No meat or slaughtering.. may be that's why I said heaven!! 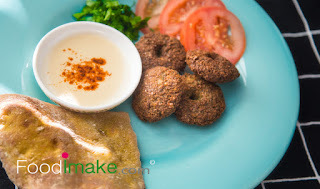 Where suppose to be the most peaceful and safe place for all.. oh that's is a big introduction for the falafel, or some people still twist the name a little and call it "felafel" but no matter how you call it, it's a great dish and sandwich should everybody try. It's amazingly getting popular the last few years in the Washington D.C area, and people loved it, so now you find it every where at the big/small super market. I cal falafel the fast food virgin of the Middle East, we grew up on falafel, remember use to eat it twice a week at least. The small little shop near the school was own by "Hael Rad" the man Hael wasn't a business type of guy, rather a carpenter as in the back of his house, he use to sell bamboo and wood lugs, but he found his gold mine -I think- by selling the falafel sandwiches and chewing gums for the nearby elementary school. I don't think he was a good cook, as his wife use to hand him the falafel ready and hot from the small little delivery window connected directly to his house. The genius idea of his sandwiches, that you don't have to buy the whole sandwich, you may buy a quarter of the sandwich, something to fit you allowance for the day, like "quarter of pita bread and one piece of falafel inside with parsley and tahini sauce for topping" and you're good to go. Falafel is completely vegetable made of garbanzo or fava beans, with selected aromatic spices, storm your appetite before you start eating. Added to the flavor the pita bread vegetable and the great tahini sauce. 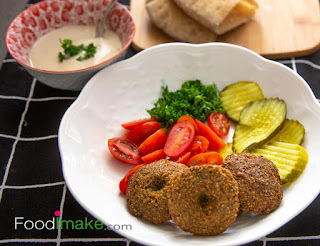 We will have an excellent recipe for the Falafel next week hopefully will see you then. Nothing easier then adding the milk to cereal and start eating!! Soon will find it very boring, so having the right combination and ingredients gets little tricky sometimes at all type of food.. unless you're always in a harry and considering this satisfactory as something, you've used to it and never go wrong!! I like to add little other touches every now and then to add extra colors to the plate and make it always appealing. 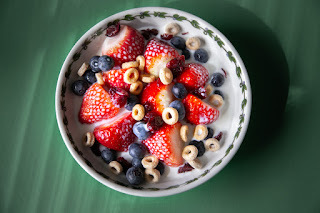 Here is one of my colored cereal simple with strawberry, blueberry, dried cranberry and cinnamon. Then adding a generous amount of natural maple syrup.. I strongly recommend to give it a try, unless you're already did. What is the secret about the homemade pizza!! It's the ingredients, yes and then the joy of making the pie, there is no place for profit here except the taste with good glass of wine. Mass production made everything and I said every thing mediocre not only in pizza, but also in guitar made and color paints! I like the taste of the cheese in pizza, not only chewing it... here I used gruyere and some mozzarella. The sauce is easy to make with the garlic and olive oil, I normally add fresh basil to the sauce, but not with this recipe! 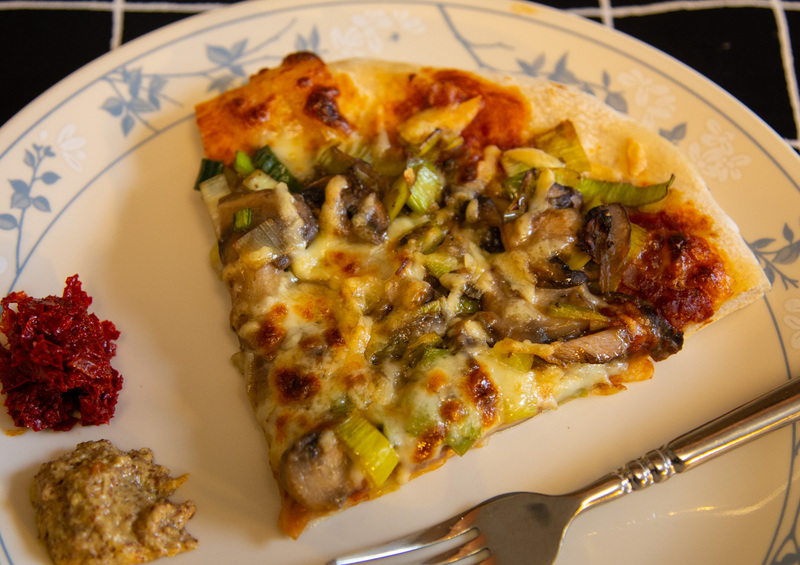 I tended keep the harmony taste between the cheese against the mushroom and leek. I'ts always great to have the dough ready and homemade, as we had it in one of the recent recipe, if you ever try it with ready made dough from the market, please let me know how is the results. Cut the mushroom, leek and onion julienne or minced, sauté the onion with two table spoon of olive oil, just before golden colors, then add the mushroom and cook it for about 4 -8 min it depends how moist are your mushroom, however cooke it till evaporate there liquid, now the time to add the leek and that doesn't need much to cooke, may be about 1 or 2 min only. Another two tbspn of live oil add garlic, sauté for 1 min or 2 then add the tomato past and stir for 30 sec. Place the dough on dust a pizza peel with good amount of flour, then place the dough. Spread the tomato sauce, the leek and mushroom topping, then sprinkle with the cheese. Bake at 450F at 8 - 10 min, hope you enjoy!